Alton Brown’s “Romancing the Bird” likely introduced a lot of people to the concept of brining, in a fun and well-reasoned way. However, after making several turkeys this way, it seemed fairly expensive/complicated, especially considering how very simple brines can have a huge difference in shrimp and chicken (“flowerpot chicken” in Alton Brown’s Gear for Your Kitchen is excellent). 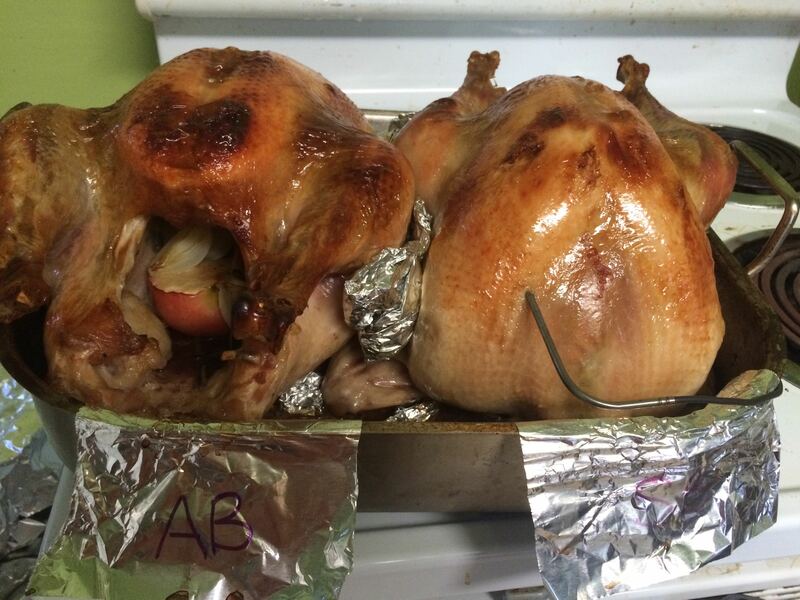 Thus, this Thanksgiving, we wanted to make two birds with different brines. Are the extra ingredients “worth it”, or do they just make us feel fancier on a holiday? In each case, combine all but the iced water, heat on a stove until the salts and sugars are completely dissolved. Pour into a large, heat-safe, container that you will brine in (e.g. a 5 gallon food container). Let the solution cool. Add the iced water to each and stir to combine. Place 1 turkey (sans neck and any mystery giblet pouches*) in each brine, breast-side down. Brine for 8 hours (we had small-ish turkeys, Alton recommends 12 hours for a 14-16 pounder), and flip turkeys half-way through. 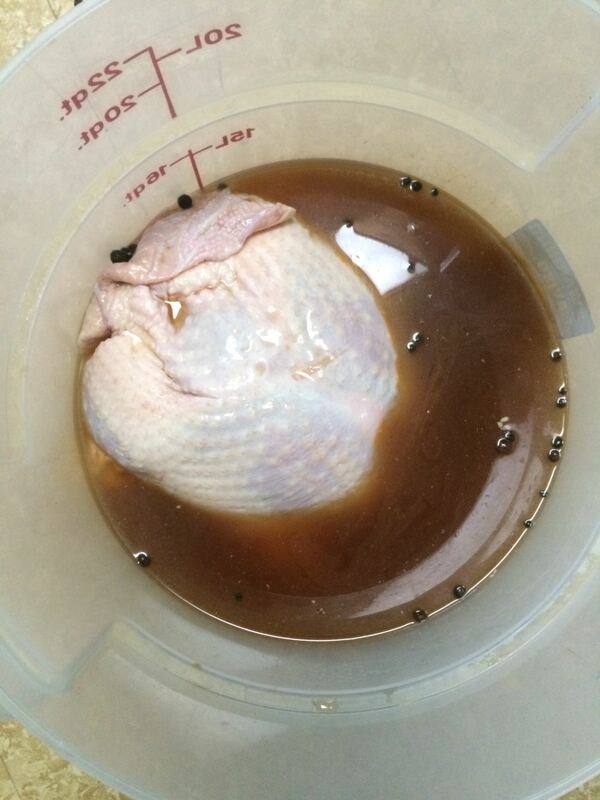 Turkey taking a brine-bath. The brine does not provide complete coverage, which is one reason for flipping the bird mid-way through. Cooking Notes: The roasting method described in Good Eats: The Early Years is what was followed (including apples, onions, and herbs/spices in the cavity). We did not use an aluminum foil “turkey triangle” (well illustrated here), which makes these instructions different than the aired episode; we are unsure why, but that is not in the book. Given the variability of ovens, we decided to roast both turkeys together in the same oven, at the same time. Unfortunately, the primary testing facility lacks a snazzy large oven, and this resulted in a VERY tight fit. This is typically not a recommended practice. Birds were lifted off the bottom of the roasting pan by aluminum foil rolled into ropes or “snakes”. 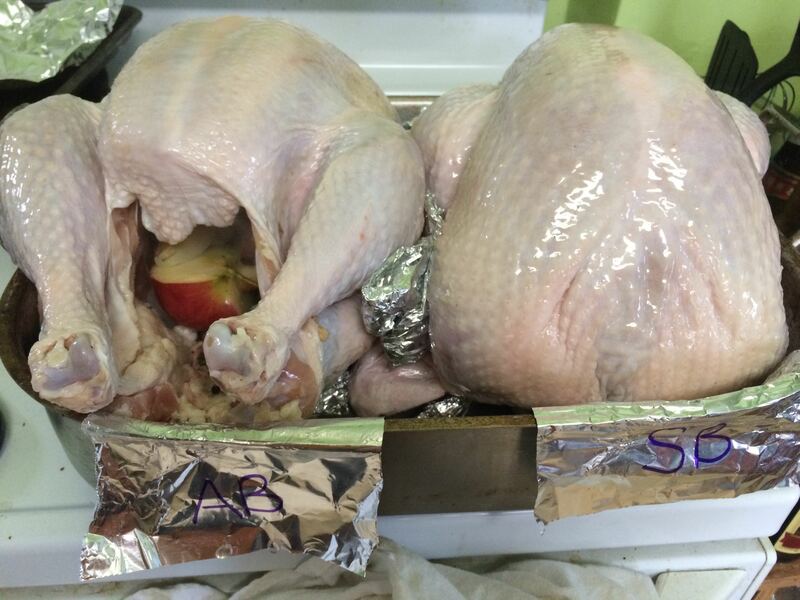 A similar foil construct was placed between the turkeys to minimize contact, promote air circulation, and reduce possibility of undercooking those sides. As a precaution against undercooking, a probe thermometer was used in one of the interior breasts (see image of cooked birds for placement). Prepped turkeys ready for roasting. Birds are sitting on, and separated by, Aluminim-foil “snakes”. 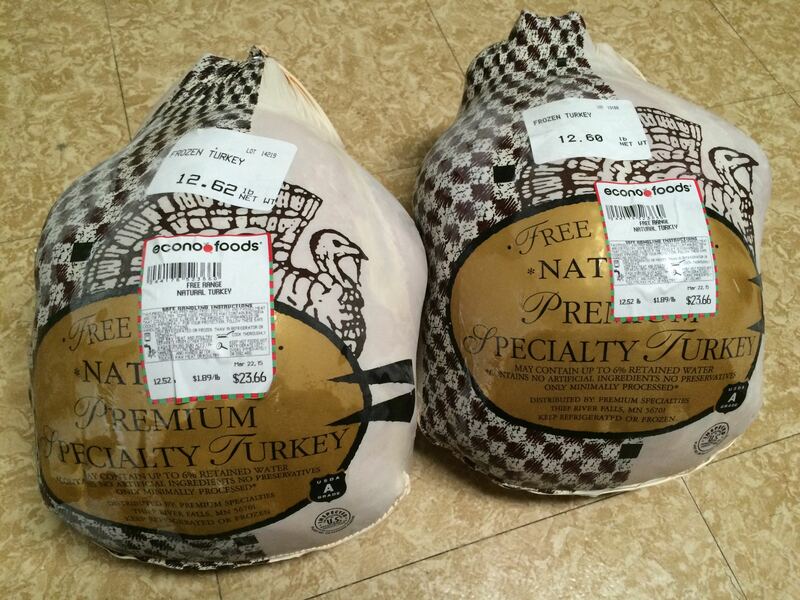 There was a noticeable difference in flavor when the turkeys are compared side-by-side. The “complex” brine did impart a more complex flavor to the turkey, which could be detected blind by one tester, and one test-child noted it had a “stronger flavor”. That turkey also seemed to have a darker skin, which could be due to the brown sugar, or aspects of the stock. Overall, the children involved in testing seemed to prefer the simple-brined bird, as they perceived it as juicier. One non-adult taster, who had her first encounter with brined turkey with this taste-test, said of the simple-brined bird: “this is the best turkey I’ve ever had”. In contrast, Beef-Master F thought the simple-brined bird seemed drier (in comparison; this was not a dry turkey), but also considered that might be due to differences in flavor. Being Thanksgiving, everyone quickly suffered from over-stuffed stomachs which prevented further analysis of this at the dinner table. There did seem to be changing preferences as the turkeys cooled, at least amongst the adults. Taste tester S’ preferred the complex brine in the hot turkey, but seemed to gravitate towards the simple brine as the turkey cooled. This might have interesting implications for left-overs. Turkeys after roasting. The “fancy” brine (left) seemed to turn out darker than the bird brined with the simple recipe (right). While there is still a question of “to brine, or not to brine”, and a newer trend of dry-brining turkeys is gaining traction (which we hope to investigate later), we still feel that wet-brining is beneficial. Notably, brining is pretty easy in colder climates, as vats of brine can easily be stashed on a cold porch. Regardless, in terms of this test, we did find that different brines did noticeably impact the resulting flavor. The question remains however, is the difference in flavor worth the additional cost? Below are the costs associated with buying ingredients for each brine. The “worst case cost” is what you might have to fork over at a grocery store, assuming you had nothing in your pantry and had to acquire everything. It is suspected that the stock concentrate contributed the most flavor to the complex brine. Using just that, and skipping the solid spices, could provide a good compromise between flavor and cost. 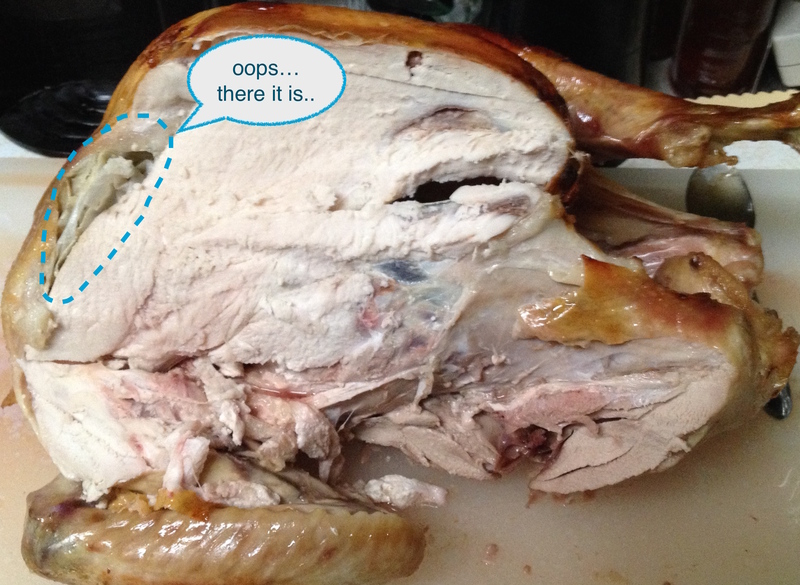 How does the brine used impact the flavor in chilled turkey leftovers? How much of the juicy-nature/non-dryness is due to proper cooking vs the brine?